If you love to decorate cupcakes and cakes, then these Geeky Sprinkles would be a great holiday gift for someone who loves geeky stuff. Geeky Sprinkles started as a Kickstarter and it is now a product. 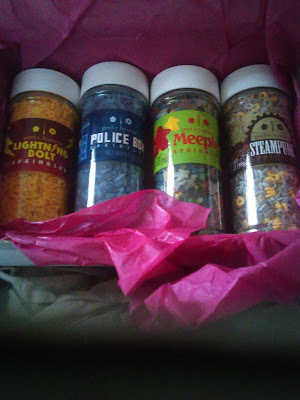 There are four different kinds of fun sprinkles: Steampunk, Police Box, Meeple and Lightning Bolt. The sprinkle are great for decorating cupcakes for birthdays and special fan-based events. Geeky Sprinkles is part of Cupcakes Take The Cake Holiday Guide which will launch on Cyber Monday. Subscribe to the Pinterest board today.